If someone steals your credit cards, call your credit card companies to cancel the account numbers and dispute any unauthorized charges. But don't stop there. Take steps to place a fraud alert on your credit reports to stop thieves from using your identity to open phony accounts. With a fraud alert, creditors must verify whether you made a request whenever a credit application is made in your name. 1. Contact a credit reporting company. 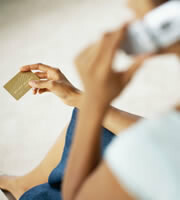 Contact one of the three major U.S. credit reporting bureaus-- Equifax, Experian, or TransUnion. These companies collect information from creditors and maintain credit reports, which are used as a basis for determining your credit score. You don't have to contact all three bureaus. Just choose one company and request a fraud alert online or by phone. By law, that company must contact the other two credit reporting bureaus to place alerts on their reports. There are two types of fraud alerts--initial and extended. Choose an initial 90-day alert if you suspect you are or are about to become a victim of identity theft, such as if your credit card gets stolen or you give out personal information in a phishing scam. An extended alert stays on your credit report for seven years, and your name is removed from marketing lists for pre-screened credit offers for five years, unless you request otherwise. You must produce a copy of a police report showing you've been an identity theft victim to get an extended alert. 2. Order and review free credit reports. Once you've placed fraud alerts, get free copies of your credit reports and review them, looking for accounts you didn't open, inquiries from companies you never contacted, or debts you didn't create. Make sure all the other information on the report is correct, such as your address, employers, name, and social security number. 3. Fix credit report mistakes and fraudulent information. If you find errors, write to the credit bureau and the financial institution reporting the mistake. Identify the disputed items, tell why they're wrong and include any documents that would back up your claim. See the Federal Trade Commission's Web site for a sample letter. 4. Monitor your credit reports. Check your credit reports thoroughly, particularly for the first year after your identity has been stolen, and respond immediately if you spot any mistakes or fraudulent activity. Meanwhile, keep your contact information on your fraud alert up to date to ensure creditors can reach you. 0 Responses to "Credit Report Fraud Alerts: How To Thwart Identity Thieves"